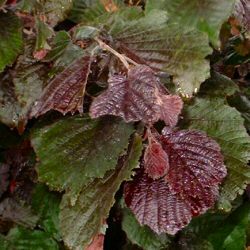 Both a small ornamental tree and a fruit tree, the red filbert or PURPLE hazel is a small tree, with a final height of 4.5m (15ft), so is ideal for a small garden. In spring it produces beautiful heart-shaped purple leaves, which alter to green as spring proceeds to summer. Its most colourful leaves seem to gained when this tree is planted in full sun position. Late winter heralds the arrival of purple-tinged catkins which in turn develop into edible nuts by the end of the summer. Red filbert is supplied at a height of between 0.5 to 0.7 metres in a 7 litre container, which means that the tree can be planted any time of the year and with better results than either bare-root or rootballed trees.